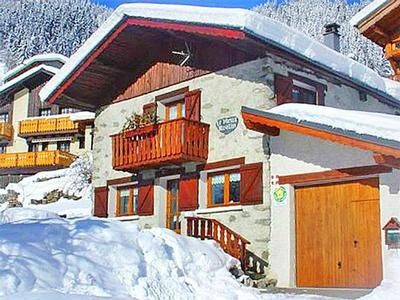 Old traditional mill, renovated as a well equipped chalet with a wood burning stove and Wi-Fi internet access. Situated in Champagny on the Reclaz stream. Distance to the village center (shops, restaurant, apres-ski, childcare) about 200 m. Distance to express cable car and ski run about 300 m walk. Altitude chalet: 1.250 m, ski area up to 3.250 m, with two glaciers. Champagny is part of the enormous ParadiSki area (La Plagne and Les Arcs) with 425 km of alpine slopes, 157 lifts. Ski area open approx. 17th of December to middle of April. From Champagny you get in 7 minutes by an express cable car on 2000 m altitude and you reach the glacier section by high speed chair lifts. Great 10 km run from “Roche de Mio” back to the village-resort of Champagny, with 1500 m vertical drop. New Highlight: The Paradiski-Skipass valid for more than 5 days includes one day in the 3Vallées Ski area (within the validity period, conditions apply); to Courchevel / ski-area 3 Vallées about 15 minutes by car. - Final cleaning: once per object Costs amounting to 60 EUR (optional). Cot (per property and day, included in price 0 EUR). Final cleaning (once per object, Costs amounting to 60 EUR).